You may have notice all the hand writing in the backgrounds of my paintings. These pages come from thousands of different people's hand written nocturnal dreams that I collage into the background of my work. These pages are to representing a physical metaphor of the Collective Unconscious. 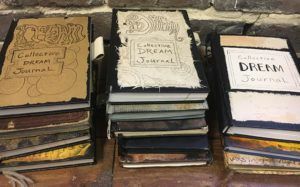 I have been collecting these dreams for over 15 years in several journals hanging outside my galleries for the public to write in. The people who participate in this on going process range in ages and nationalities, having written them in over two dozen languages as well. 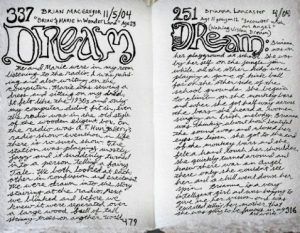 The imagery I paint on top of these dream pages comes from three main view points I have on the Collective Unconscious. First an illustration of a dream or meditation, second a concept or theory about Dreams, or third an inspiration from a dreamlike place I have travel to around the world. I call my style "Romantic Surrealism" inspired by the artists of the late eighteen hundreds, mixed with contemporary artistic methods. My medium is heavily mixed, involving drawings over collaged dreams on canvas first with a layer of acrylic and then many thin layers of oil on top. Many of the paintings are framed in a sculptural process I call "Mixed Frames". These are a mix of up-cycled, high-end frames that I deconstruct and reassemble to create into Sculptural Paintings. 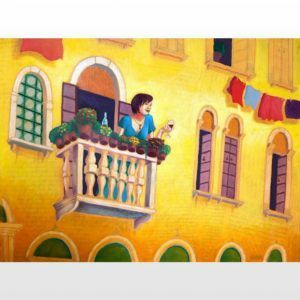 Brian MacGregor is a nationally recognized fine artist who is a graduate of the Savannah College of Art and Design, better know as SCAD. 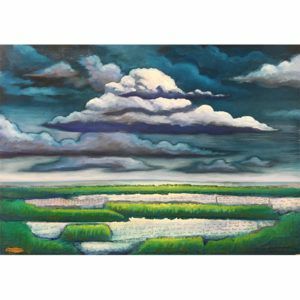 He has won over twenty awards including the National Congressional Art Award, International IASD First place Dream Art Award, Best of Savannah Art Award 2007 and more. He's done over ten solo gallery shows and over fifty group shows across the country. MacGregor has been interviewed by several magazines international and national, newspapers, Radio shows, and television, from NPR, to many Local News outlets as well. 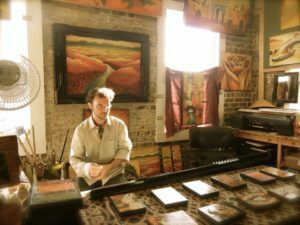 MacGregor was raised in Richmond, VA and moved to Savannah, GA in 2000, soon after he started displaying his art in the City Market's Art Center. 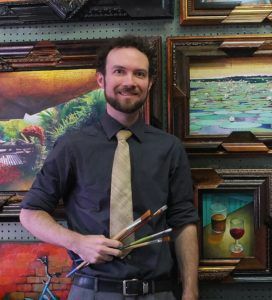 MacGregor is a professional Artist with 20 years experience and owns a public Studio / gallery of his work in the heart of downtown Savannah. 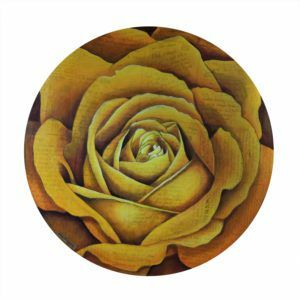 He has had a decade of art training from an arts high school to self study across Great Britain, and is a graduate of SCAD.